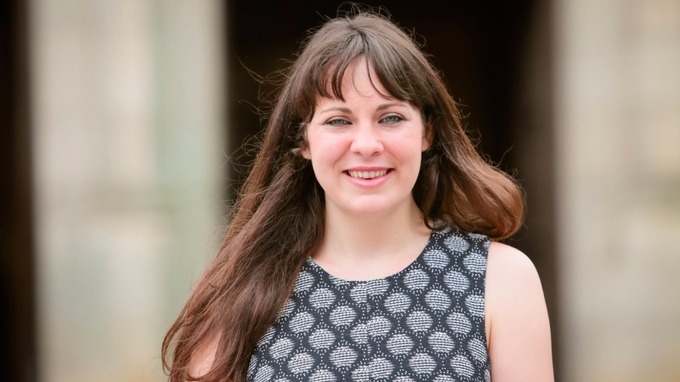 Amelia Womack has been re-elected as the Deputy Leader of the Green Party. The text below is the full transcript of Amelia Womack’s speech to Green Party Autumn Conference after being re-elected Deputy Leader of the party. With two people holding the leadership post, Womack is now the sole Deputy Leader, forming part of a new leadership team alongside co-leaders Caroline Lucas MP and Jonathan Bartley. Firstly, thank you. To all of you here – and to everyone who voted in the biggest internal election that our party has ever seen. And without a single member purged!. But seriously. With so many talented candidates in the deputy leadership vote, I am honoured and proud to have been re-elected to continue my work as your deputy leader. Thank you to all of the candidates who have worked tirelessly, not just during this campaign, but every day in their roles as councillors, campaigners and community champions. Please join me in thanking each and every one of them. 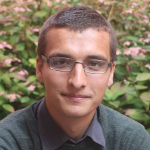 And please also join me in saying a special thank you to Shahrar – for all he’s done as co-deputy over the last two years. What an amazing time it’s been for our party. We’ve grown beyond what many could have imagined just a few years ago. Over the past two years I’ve got to visit over a hundred local parties – if they gave out ‘train miles’ like ‘air miles’ I’d be able to book enough journeys for both me AND Jeremy Corbyn to get to Newcastle and back for a lifetime – with reserved seats! But there’s one person who has spent more time on trains than anyone I know, and probably more time sat in carriage corridors than some leaders I know (although I’m still waiting for footage from Virgin). Natalie – we all owe you so much for your commitment and dedication to this party – thank you. Without you, this room would be a lot emptier today. You have been such an important part of the Green surge and we all owe you a huge debt of gratitude. I know that you will remain a powerful voice for change within our party and our politics. Two years ago, you elected me as the youngest woman in a leadership position in British politics when I was 29 – a year younger than I’d have been allowed to have any say just a century ago. Although even when women did get the vote back then, property ownership was a prerequisite – if that were the case today I don’t know many young women who’d be allowed anywhere near a ballot box! In those two years we have proved that young people can lead. That a movement which embraces people of all ages and all backgrounds is made stronger by its diversity. That a woman’s place is at the podium, not as the backdrop to men in suits. I’ve got a little figure in my room that reminds me of that when I’m working – it’s a suffragette, made by a Young Green for my 30th birthday. And it reminds me every day that it’s not well behaved women who make history – it is those who take risks, speak truth to power and have the tenacity to take on establishment thinking time after time. In fact, it’s not the well behaved anyone who makes history – it’s those with the ideas, the passion and the action to force a stagnant establishment to shift. I will be one of those voices in the two years ahead – and make our party the home of all those who want a radical, united and proudly progressive politics – a party that has room for everyone. And as Greens we have to be tenacious and campaign to ensure that our voices are heard. This past two years I’ve seen us already show that you don’t need hundreds of seats in Westminster to make change. You are doing it here and now. Because let’s be honest – change is badly needed. This is the truth conference – I am angry. I’m angry for the young people who’ve had their student grants abolished and their chances of getting a house ripped up through right to buy. I’m angry for the communities whose lives are being blighted by fracking – and at the councillors who forced that policy through in Yorkshire, against the wishes of the people they claim to represent. And I’m angry for the EU migrants being used as a bargaining chip by Theresa May – with their futures in this country hanging by a thread. In Britain we’re used to being told to ‘Keep Calm and Carry on’ – but the truth is that a stiff upper lip doesn’t put dinner on the table of a young family, it doesn’t make up for a generation set to be poorer and more insecure than their parents,and it won’t stop an environmental crisis that’s being ignored for far too long.. But conference, in the Greens, we turn Keep Calm and Carry On to Get Angry and Get Organised. So we are organised in the face of so much turmoil. We are united where other parties are tearing chunks out of each other. And we are, and always will be, a proudly democratic party – something which gives us the principles that set us apart. Because we’re for a new politics – a politics of real democratic reform. So this next two years we need to fight harder than ever to make every vote count, and every person’s voice heard, by working towards a fair and proportional voting system that has democracy at its heart. Funnily enough, June 23rd was the first time many felt their vote had actually counted. That’s a damning indictment on our political system. So I was disappointed – but not surprised – to watch Caroline’s bill on proportional representation be torpedoed by Tory and, sadly, some Labour MPs this summer – a bill that we desperately need in this country. People can’t be left unrepresented. If the EU referendum showed anything it was that people in this country are sick and tired of being sidelined, of being told they live in a democracy while having their views systematically shoved to one side. June 23rd was the shout of the ignored. So we have to fight for those voters and turn that anger into something positive – to turn the blame away from migrants and onto a crumbling economic system. We are the ones to do that, because we know that every progressive movement has the potential to set dominos tumbling in motion that can lead to the collapse of an unfair and unjust system. We’re not as big as the other parties – we don’t have the same money at our disposal to throw at campaigns. But in just the last few months we’ve shown what we’re about: standing with junior doctors against unsafe and unfair contracts. Standing with Byron Burger workers against the honey trap set by their bosses. And standing against Hinkley C to help turn public opinion against another disastrous nuclear project. But friends, the truth is that these are dark times. The rise of xenophobia and racist attacks after the Brexit vote has been horrifying. It’s the fallout from a debate that turned truly nasty. Conference, join me in saying we will never, ever, pay lip service to the politics of division. So the real work starts now. We need to reunite our communities – because the ties that bind us are stronger than the people trying to tear us apart. Because I know that I have more in common with the woman wearing a burkini than I do with those police who made her undress on the beach. That I have more in common with the striking Deliveroo workers than the bosses who exploit them. Friends, while politics seems to be plagued by turmoil this year, we have stood united, stood strong, and stood proud in our convictions. 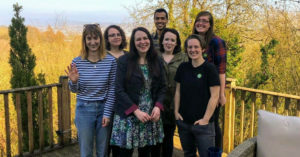 We stood strong on the EU referendum, we stood united in our campaign to protect our environment, and we stood proud in our conviction that people should be able to live, love and work in the places they want to call home. So I need to say it again: the real work starts now. Because even though we may not have won the referendum – we absolutely have to win the battles ahead. I want to spend the next two years doing just that. Together, let’s say – we will not stand by while workers’ rights are torn up. We will not stand by while migrants are scapegoated. And we will not stand by while our climate change directives are cast aside at the whim of big business. There’s only one way of saying this: we have a huge responsibility. Because, friends, you here today – each and every one of us – are the opposition. So let us not flinch at this task – of stirring up something that we haven’t seen in this country for a long time: hope. Let’s stand in the finest traditions of suffragettes, chartists, and trade unionists. Let’s stand in the traditions of road blockaders, divestment activists and power station occupiers. Let us all play our part in the challenges ahead. Because whether you donate to our campaigns, deliver leaflets in local by-elections, or if you are one of our many unsung volunteers – you are all vital. Our members make us strong, our philosophy and belief in the power of grassroots action keeps us united, and I’m proud to be able to thank you all for helping to make this party the success it is today. Conference, I said earlier that I was angry. But I am also hopeful. I know the scale of the fights ahead. And I thank you for re-electing me to lead them. But I know that we are in a better place than ever – as an unapologetically progressive party – to be the voice of the ignored, the alienated, and all those looking for hope, in the years ahead. So conference, it gives me great pleasure to congratulate Caroline and Jonathan on their overwhelming election victory. 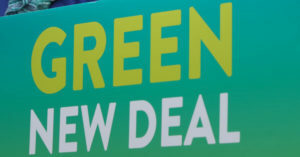 I can’t wait to get started as part of a new and inspiring leadership team – and I know that together we are going to turn the green surge into green success. The work begins here – let’s get started. The headline – we’re the opposition post-Brexit – hardly fits the speech – that we’ll voice the popular anger against policies hitting us and failed political parties. No recognition that the GP’s anti-Brexit campaign that Amelia spearheaded made little impact. No allusion to Wales. after Amelia proclaiming she’s Welsh and seeking election to the Welsh Assembly this summer. No lessons learned about her own failure to attract the voters and GP politicians generally (with of course exceptions like the SW/Bristol.